This post is so overdue I'm almost embarrassed, but I have committments and I must share this review with my readers and anyone else looking for a smartphone. I'm IN LOVE with this phone and have been for a few months now. No matter what's going on, there is a use for this phone! Email, texting, sending videos and photos, web browsing, using Twitter, updating my Facebook or MySpace status - even getting directions - it can all be done easily from this phone! I now understand the term "Crackberry". This phone is like my crack! I can't go anywhere without it! Let's also talk about hands-free use - it's easy to do since there's a neat little button on the side that you push and the lady's voice says "Say a command". You can then tell her to call someone in your contacts or say a number. Be sure to speak clearly, though, because I've had "her" think I was calling a number way different than the one I originally said! Let me also touch on the photos - I am truely impressed with the quality and clarity of the photos that the Tour takes! I've taken photos while at football practice, trick-or-treating, and all over the place, and they turned out beautiful! And, the only editing I needed to do was to crop the photo, if I so chose to do so. 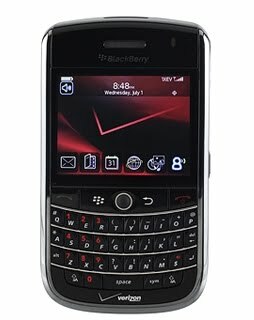 The Blackberry Tour 9630 is a 3G phone with many capabilities that will have you admitting that you are a Crackberry user! Earlier this year, I purchased a T-Mobile Sidekick and although at first I loved that phone, I started noticing more and more issues with it, and I am especially glad that I don't use that phone anymore since the "great Sidekick data loss of 2009" - I personally would have been hopping mad! Now I have a better smartphone and it's way cuter too! 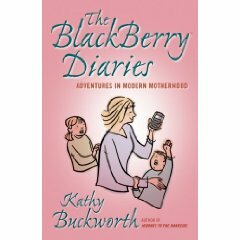 titled "The BlackBerry Diaries: Adventures in Modern Motherhood," a year-long blog account of Kathy’s life with her new BlackBerry phone and how, as a mother of four, her two worlds — technology and children — collide. This book is hilarious and I'd love for you to read it - so head over to Santa's Picks to win one of three copies of this book! I literally just finished this book a few weeks back, due to multiple projects, but it was so funny and there were so many things that Kathy wrote about that I could relate to! I'm a tech junkie - although I can't afford all of the latest and greatest gadgets, I love every single one of them. My wish list is HUGE! I personally can't live without my gadgets! In my purse, you'll find my Creative Vado video camera, my digital camera, as well as my Blackberry! Not one of them will you ever find me without! There's too many opportunities for photos out there and God forbid that I miss one! All of my gadgets enable me to be able to chronicle our lives, in digital form! Disclaimer: Research in Motion provided me with the books and the Blackberry Tour in the review above. I also received a month of free Verizon cellular phone service in conjunction with this review. The opinions expressed above are solely my own and yours may differ. Receiving a product will NEVER influence what I write in any review.